2D Cupcake toppers for baby shower in blue, white and a touch of yellow for baby boys, also comes in pink-white-yellow for baby girl. 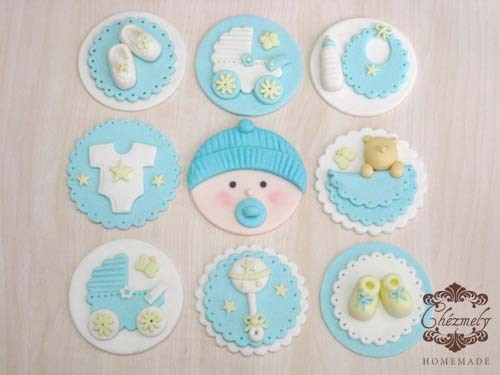 We also have baby shower decorated cookies and chocolate lollies that can be made into cupcake toppers or nicely wrapped as a giveaway for the guests. Book your order at least 2 weeks in advance for preparation, special price available for party package of minimum 2 dozens for each product. Previous postThis Month’s Promo : It’s All About Green Tea!